along with today being the birthday of e.b. white it is also the birthday of peace activist cindy sheehan. cindy is currently visiting northeast ohio. I had the opportunity to meet cindy wednesday afternoon. cindy is touring the country to promote her new book and to remind people that just because w is out of office that doesn't mean that we can sit back on our laurels. there are two wars still being waged and we can't just wait for peace to happen - there is still plenty of work needed to do to make peace happen NOW! in addition to her older books, which include, peace mom and not one more mother's child, cindy just released a new internet-based book entitled myth america. in this book she provides a discussion of 10 myths that many americans seem to accept - hook, line, and sinker. cindy's talk to the group gathered in cleveland heights peace park on wednesday primarily discussed these ten myths. cindy also discussed her congressional challenge against nancy pelosi. she stated that even though it was incredibly difficult, taxing, and expensive the race did provide her with the equivilent of ph.d in political science. 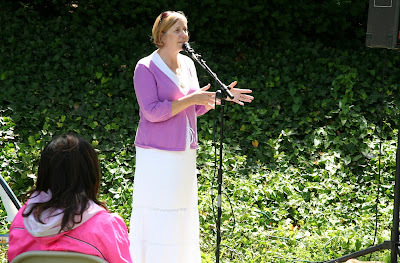 cindy hosts a weekly internet radio program, cindy sheehan's soapbox. in addition to being available via the internet 24/7 there are a few radio stations that broadcast the show. one station that airs the show is in dallas, cindy quipped that she has a fantasy that a certain dallas resident makes sure to tune in every sunday. another person born on july 10 is béla fleck - clearly here's is a guy that improves the world every time he picks up magical banjo of his! I love Bela Fleck. Every year for the past 3 years, he has visited Redding and performed at our Cascade Theatre. It is an art deco builiding in the downtown area that our community has lovingly restored. It is beautiful and so are the acoustics. Nice post. Love this piece (and I first mis-typed it as "peace," an apropos mistake). Since I'm a cat lover with a preference for long-haired felines with great abandon and sensuality, of course your opener grabbed me. But then I sank into the info on Cindy Sheehan and learned about Bela Fleck. Thanks! Links, glorious links. Thanks, kim. Bela Fleck is a discovery for me. Anyone interested, there's a bunch of vids on youtube where he's playing with Chick Corea. Très cool ! I wonder what her ten myths are? I'm very curious about that book -- I'll check it out! Cindy Sheehan often gets attacked for self-promotion, but I think she's awesome. I love EB White. Easily one of my favorite writers. Wow! So many people born on July 10. I'll definitely have to check out Cindy's new book to see if I've fallen for any of those myths. And the Bela Fleck piece was wonderful! Hi! I like your quote too; my E.B. White card said your quote like this, which is more edgy in a way. Nice to read about Cindy Sheehan. She is still the poster girl the Right Wing love to point to as "extremist" and "apologist" in every way. That never ceases to amaze me. Her terrible loss turns into a movement sorely needed. She is helping prevent more terrible losses by other mothers and still they vilify her. I admired her courage at Crawford, when she first caught the media's eye. I admire her now more than ever. As a Liberal, I guess there is no greater accolade than to be the brunt of the extremists on the right. She really found her stride, didn't she? If you have to lose your son, then this is the way to try to fill the hole. Maybe save someone else's son. my doggie lays like this...either he thinks he is a cat, or wants his belly rubbed. 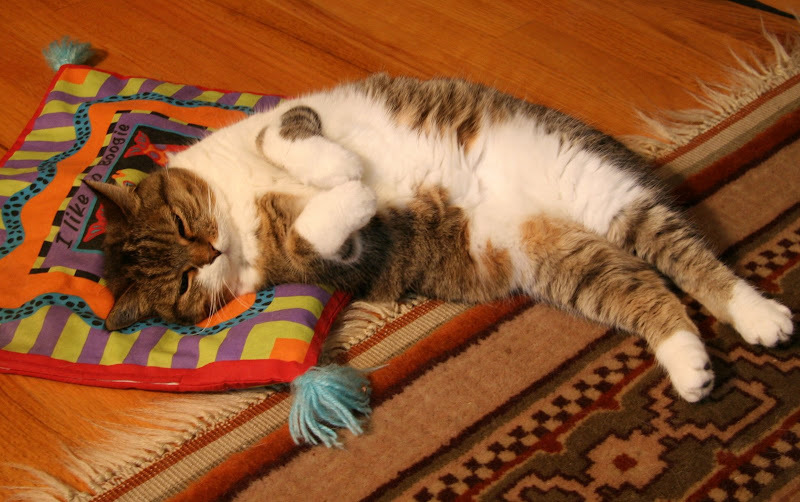 The cat has life figured out.